We're pleased to announce the launch of a new mobile website, developed in partnership with OSU Libraries: Bart King's Architectural Guide to Portland. 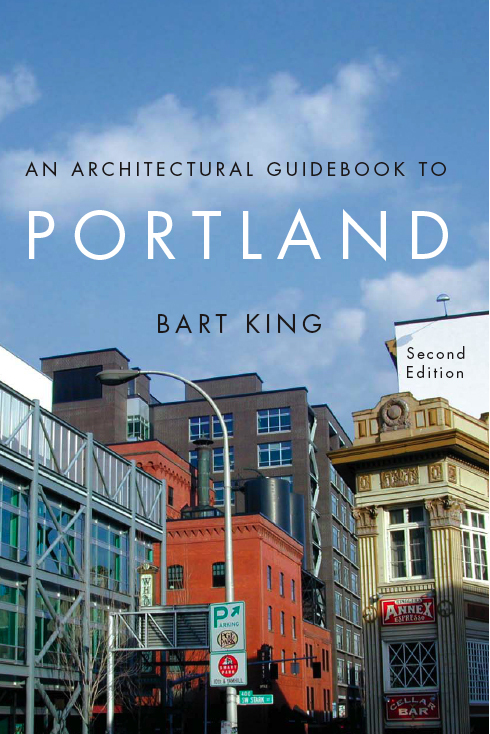 The site features rotating content selected from Bart King's popular An Architectural Guidebook to Portland, a volume rich with photographs and stories about Portland's celebrated cityscape. Portland’s civic planning, historic preservation, and emphasis on sustainable design are explored in detailed profiles of structures that have distinguished (or disgraced) themselves in some interesting fashion. Discover that magic by exploring Portland using content from Bart's book via the website online or through any web-enabled mobile device. The mobile website features twelve districts, including Downtown, Cultural District, Government Center, Old Town-Chinatown, The Pearl, and all four quadrants. Each entry includes Bart's detailed and witty narrative about the structure, photographs, and an interactive map providing real-time walking or driving directions. The collaboration, according to Press Director and Donald and Delpha Campbell University Librarian Faye Chadwell, "is the first example of numerous planned collaborations between OSU Press and OSU Libraries, leveraging the Libraries' knowledge of mobile development and user-centered design with the Press's mission to provide better understanding of our region." You can read more about the site's development here. Learn more about Bart King at his website. Just before Jeff Crane's environmental history of the Elwha River was published last fall, the demolition of its dams began. It seems that dam removal has been in the news ever since. Today, we welcome the author of Finding the River to our blog. 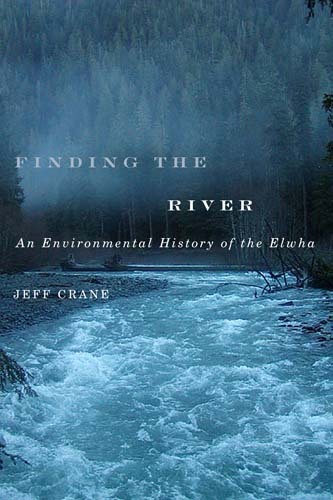 He shares the roots of his book and his personal history with the Elwha. My interest in the Elwha River began with landscape: the beauty of the Olympic Peninsula, the iconic power of the Elwha River. When I first began hiking and exploring the peninsula as a young man, I was reading Barry Lopez, Edward Abbey, Murray Morgan, and others. These writers helped me see nature with new eyes and also begin to think about the relationship between society and nature and the importance of integrating environment into history. The Elwha caught my eye with its beauty and seeming wildness. The dams triggered my imagination. Exploring the lower and upper river on my first trip in 1990, I was startled by the small size of the Elwha Dam. Having grown up on a steady diet of road trips to eastern Washington with tours of Grand Coulee Dam and other monolithic, even symbolic dams of the Columbia and Snake, I was surprised by the relative puniness of this dam that did so much damage to the Elwha’s salmon runs. Upstream, making my way to the Whiskey Bend trailhead, I pulled out to observe Glines Canyon Dam, one that in its beauty and construction invoked the other, classic dams of the West. Thus informed of the reality of the river, much of my first hike was occupied with thoughts of what this river might have once looked like. The robust forests cloaking the slopes of mountains; the healthy, beautiful tributary streams; and the Elwha River itself struck me as missing something essential. Beginning my studies at The Evergreen State College in 1991, I learned more about the Native peoples of the Olympic Peninsula, the uses of the land in the region, and the efforts to remove the Elwha dams. Of course, I was a long way from even thinking about a book when I was an undergrad stomping up the Elwha River trail numerous times, camping in rain, fog, and even sunshine. One memorable trip was conducted in snowshoes on a bright January day after a surprise snowfall. The tracks of coyotes, the elk in the river bottom below Humes Ranch with the plumes of condensed breath trailing their slow walk over gravel bars, and the Elwha itself, seduced me into a deep love of this river. Bruce Brown’s Mountain in the Clouds not only increased my understanding and passion for the peninsula landscape but also made me aware of the story of the Elwha’s damming. When I started my graduate studies at Washington State University and told my advisor Paul Hirt about the damming of the river and the federal legislation of 1992 calling for restoration of the salmon, he encouraged me to write my thesis on the Elwha. Thus began a research and writing project both more difficult and interesting that I would have ever imagined. Jeff Crane is associate professor of history at Sam Houston State University. He coedited Natural Protest: Essays on the History of American Environmentalism and his essays are published in Oregon Historical Quarterly and Columbia. He grew up exploring the Olympic Peninsula and hiking along the Elwha. Friday, June 8, 7 p.m. Orca Books, Olympia, WA. Monday, June 11, 7 pm. Carver Room, Port Angeles Library, 2210 South Peabody St, Port Angeles, WA. Presented by Port Books & News. Wednesday, June 13, 7 pm. Grass Roots Books & Music, 227 SW 2nd St, Corvallis OR. Download an excerpt from the Finding the River. Follow the dam removals at the National Park Service's Elwha River Restoration site.